Originally signed as a non-drafted free agent by the New York Yankees, January 6, 2011...Resides in Ciudad Obregón, Sonora, Mexico. Was acquired by the Cardinals on July 28 from the Yankees along with LHP Chasen Shreve for 1B Luke Voit and International Cap Space...Reported to Memphis (AAA)...Had pitched 17 games for Scranton Wilkes-Barre and four games in New York (AL) before the trade...Appeared in 13 games at Memphis and two in St. Louis after arriving via trade...Made his St. Louis debut vs. SF (9/23) pitching a scoreless 9th inning allowing one hit with two strikeouts...Retired his lone batter faced two days later vs. MIL (9/25)...Fanned 10 in 10.0 innings pitched in his four appearances for the Yankees, including a career-high six on 6/27 at PHI in his 3.0 IP...Pitched in 30 minor league games, all in relief, at Scranton Wilkes-Barre (AAA) and Memphis (AAA) posting a 2-1 record with a 2.64 ERA and an 0.92 WHIP...Was 2-1 with a 3.90 ERA in 17 appearances at Scranton Wilkes-Barre, fanning 41 over 27.2 innings (13.34 K/9 IP); and 0-0 with an 0.54 ERA in 13 appearances at Memphis striking out 16 over 16.2 innings...Recorded three total saves...Struck out a season-high seven batters in 2.2 innings of relief vs. Durham (6/5)...Struck out a batter in each of his first 29 minor league appearances before the streak was snapped in his final appearance of the season with Memphis (9/3) at Nashville in which he pitched only one-third of an inning...Did not allow a home run in his last 20 minor league appearances...Was recalled from Memphis (AAA) on 9/21 after performing as a key fixture in the Redbirds bullpen as they won the Triple-A National Championship and second consecutive Pacific Coast League title...Sent the Redbirds to the PCL Championship with a twostrike walk-off single in the 10th inning vs. Oklahoma City (9/9) in his second professional plate appearance, also earning the decision as the winning pitcher...Posted a combined record of 2-0, 2.57 ERA in five postseason games...Earned save in the PCL Title clinchingwin over Fresno. Was 0-1 with a 4.87 ERA (20.1IP, 11ER) in 16 relief appearances over four stints in his ﬁrst Major League action with the Yankees (5/11-21, 5/31-6/16, 8/12-13 and 8/31-10/1)…allowed 5-of-10 inherited runners to score…retired 10-of-16 ﬁrst batters faced (62.5%)... Made his Major League debut in 5/12 loss vs. Houston, retiring his only batter faced (Carlos Correa) in the ninth to strand two runners (0.1IP)... Recorded the ﬁrst loss of his Major League career on 6/15 at Oakland, allowing 3H and 2ER in the 10th inning (1IBB, 1K)... Tossed a career-high 3.0 innings in 5/14 Game 2 loss vs. Houston (1H, 1R/0ER, 1BB, 3K)…collected his ﬁrst career strikeout (Brian McCann, swinging)... Struck out a career-high four batters over 2.2 scoreless innings in 8/12 loss vs. Boston (1H)... In 28 relief appearances with Triple-A Scranton/Wilkes-Barre, went 4-2 with seven saves, a 2.08 ERA (43.1IP, 10ER) and 69K…at the time of his ﬁnal call-up, led the IL and was tied for sixth among all minor leaguers with a 14.33 K/9.0IP ratio (min. 40.0IP)... Attended spring training with the Yankees, making ﬁve relief appearances and going 1-0 with a 3.00 ERA (6.0IP, 2ER)…made one relief appearance for México in the World Baseball Classic (2.0IP, 1ER). Split the season between Double-A Trenton and Triple-A Scranton/Wilkes-Barre, making a total of 42 relief appearances while going 7-2 with four saves and a 1.27 ERA (78.0IP, 48H, 13R/11ER, 17BB, 106K, 5HR)…led all minor league pitchers (min. 75.0IP) with a 12.23 K/9.0IP ratio and a 36.1% strikeout rate (106K, 294BF), ranked fifth in ERA and opponents' batting average (.175) and 12th with a 6.24 K/BB ratio…opponents batted .175 (48-for-274); LH .129 (16-for-124), RH .213 (32-for-150). Began the season with Trenton, going 2-1 with two saves and a 1.09 ERA (33.0IP, 20H, 6R/4ER, 7BB, 53K, 1HR) in 17 relief appearances. Also pitched for Scranton/WB, going 5-1 with two saves and a 1.40 ERA (45.0IP, 28H, 7ER, 10B, 53K, 4HR) in 25 relief outings. During the postseason for the RailRiders, went 2-0 with two saves and did not allow a hit over 6.2 scoreless innings (1BB, 9K) across four relief appearances…earned saves in the RailRiders' Governors' Cup-clinching game at Gwinnett and the Triple-A National Championship Game vs. El Paso. Prior to the season, made one relief appearance for México in a World Baseball Classic qualifying game (1.0IP, 1H, 2K). Was added to the Yankees' 40-man roster on 11/18/16. Combined at Single-A Tampa, Double-A Trenton and Triple-A Scranton/Wilkes-Barre to go 3-1 with ﬁve saves and a 1.71 ERA (63.0IP, 41H, 15R/12ER, 9BB, 64K, 2HR) in 35 relief appearances…held opponents to a .183 (41-for-224) BA; LH .157 (13-for-83), RH .199 (28-for-141)... Went 1-0 with ﬁve saves and a 0.96 ERA (28.0IP, 3ER) in his ﬁnal 18 appearances of the year (combined at all three levels)... Spent the majority of the season with Tampa, going 3-1 with ﬁve saves and a 1.35 ERA (53.1IP, 32H, 11R/8ER, 7BB, 54K) in 30 relief appearances... Also pitched for Trenton (3G, 5.40 ERA, 6.2IP, 4ER) and Scranton/WB (2G, 0.00 ERA, 3.0IP, 0ER)... Following the season, appeared in 13 games for Yaquis de Obregón of the Mexican Winter League and went 1-2 with a 10.00 ERA (9.0IP, 10ER). Spent the entire season with Single-A Charleston, going 5-5 with one save and a 4.57 ERA (88.2IP, 108H, 56R/45ER, 19BB, 91K, 8HR) in 29 games (six starts)…his 1.52 BB/9.0IP ratio (59.1IP, 1IBB) as a reliever ranked fourth in the SAL... Following the season, went 1-1 with 1.69 ERA (16.0IP, 3ER) in 16 relief appearances for Yaquis de Obregón of the Mexican Winter League. Made 16 starts with short-season Single-A Staten Island, going 2-8 with a 4.27 ERA (65.1IP, 71H, 32R/31ER, 14BB, 43K, 9HR)…tied for the NYPL lead in starts and ranked ﬁfth among starters with a 1.93 BB/9.0IP ratio... Following the season, made ﬁve relief appearances with Yaquis de Obregón of the Mexican Winter League, going 1-1 with a 4.26 ERA (6.1IP, 9H, 3ER, 2BB, 3K). Made his professional debut with the GCL Yankees, going 0-1 with a 1.67 ERA (27.0IP, 20H, 7R/5ER, 2BB, 22K,1HR) in 12 appearances (four starts). 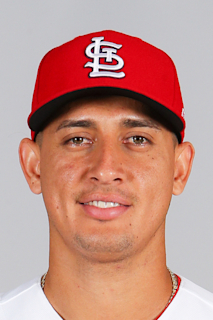 April 16, 2019 St. Louis Cardinals recalled RHP Giovanny Gallegos from Memphis Redbirds. April 15, 2019 St. Louis Cardinals optioned RHP Giovanny Gallegos to Memphis Redbirds. April 7, 2019 St. Louis Cardinals recalled Giovanny Gallegos from Memphis Redbirds. March 9, 2019 St. Louis Cardinals optioned RHP Giovanny Gallegos to Memphis Redbirds. September 21, 2018 St. Louis Cardinals recalled Giovanny Gallegos from Memphis Redbirds. August 1, 2018 RHP Giovanny Gallegos assigned to Memphis Redbirds. July 25, 2018 New York Yankees optioned RHP Giovanny Gallegos to Scranton/Wilkes-Barre RailRiders. July 22, 2018 New York Yankees recalled Giovanny Gallegos from Scranton/Wilkes-Barre RailRiders. July 10, 2018 New York Yankees optioned RHP Giovanny Gallegos to Scranton/Wilkes-Barre RailRiders. July 9, 2018 New York Yankees recalled Giovanny Gallegos from Scranton/Wilkes-Barre RailRiders. July 1, 2018 New York Yankees optioned RHP Giovanny Gallegos to Scranton/Wilkes-Barre RailRiders. June 25, 2018 New York Yankees recalled Giovanny Gallegos from Scranton/Wilkes-Barre RailRiders. June 19, 2018 New York Yankees optioned RHP Giovanny Gallegos to Scranton/Wilkes-Barre RailRiders. June 18, 2018 New York Yankees recalled Giovanny Gallegos from Scranton/Wilkes-Barre RailRiders. May 23, 2018 New York Yankees optioned RHP Giovanny Gallegos to Scranton/Wilkes-Barre RailRiders. May 21, 2018 New York Yankees recalled Giovanny Gallegos from Scranton/Wilkes-Barre RailRiders. May 10, 2018 Scranton/Wilkes-Barre RailRiders activated RHP Giovanny Gallegos from the 7-day disabled list. April 9, 2018 Scranton/Wilkes-Barre RailRiders placed RHP Giovanny Gallegos on the 7-day disabled list. March 21, 2018 New York Yankees optioned RHP Giovanny Gallegos to Scranton/Wilkes-Barre RailRiders. October 22, 2017 New York Yankees activated RHP Giovanny Gallegos. October 3, 2017 New York Yankees reassigned RHP Giovanny Gallegos to the minor leagues. August 31, 2017 New York Yankees recalled RHP Giovanny Gallegos from Scranton/Wilkes-Barre RailRiders. August 13, 2017 New York Yankees optioned RHP Giovanny Gallegos to Scranton/Wilkes-Barre RailRiders. August 12, 2017 New York Yankees recalled Giovanny Gallegos from Scranton/Wilkes-Barre RailRiders. July 4, 2017 Scranton/Wilkes-Barre RailRiders activated RHP Giovanny Gallegos from the 7-day disabled list. June 16, 2017 New York Yankees optioned RHP Giovanny Gallegos to Scranton/Wilkes-Barre RailRiders. May 31, 2017 New York Yankees recalled Giovanny Gallegos from Scranton/Wilkes-Barre RailRiders. May 22, 2017 New York Yankees optioned RHP Giovanny Gallegos to Scranton/Wilkes-Barre RailRiders. May 11, 2017 New York Yankees recalled Giovanny Gallegos from Scranton/Wilkes-Barre RailRiders. March 15, 2017 New York Yankees optioned RHP Giovanny Gallegos to Scranton/Wilkes-Barre RailRiders. November 18, 2016 New York Yankees selected the contract of Giovanny Gallegos from Scranton/Wilkes-Barre RailRiders. August 31, 2016 RHP Giovanny Gallegos assigned to Scranton/Wilkes-Barre RailRiders from Trenton Thunder. August 25, 2016 RHP Giovanny Gallegos assigned to Trenton Thunder from Scranton/Wilkes-Barre RailRiders. August 19, 2016 RHP Giovanny Gallegos assigned to Scranton/Wilkes-Barre RailRiders from Trenton Thunder. August 18, 2016 RHP Giovanny Gallegos assigned to Trenton Thunder from Scranton/Wilkes-Barre RailRiders. June 8, 2016 RHP Giovanny Gallegos assigned to Scranton/Wilkes-Barre RailRiders from Trenton Thunder. May 22, 2016 RHP Giovanny Gallegos assigned to Trenton Thunder from Scranton/Wilkes-Barre RailRiders. May 17, 2016 RHP Giovanny Gallegos assigned to Scranton/Wilkes-Barre RailRiders from Trenton Thunder. April 4, 2016 RHP Giovanny Gallegos assigned to Trenton Thunder from Scranton/Wilkes-Barre RailRiders. March 26, 2016 RHP Giovanny Gallegos assigned to New York Yankees. September 11, 2015 RHP Giovanny Gallegos assigned to Scranton/Wilkes-Barre RailRiders from Trenton Thunder. September 7, 2015 RHP Giovanny Gallegos assigned to Trenton Thunder from Scranton/Wilkes-Barre RailRiders. September 6, 2015 RHP Giovanny Gallegos assigned to Scranton/Wilkes-Barre RailRiders from Trenton Thunder. September 1, 2015 RHP Giovanny Gallegos assigned to Trenton Thunder from Tampa Yankees. June 1, 2015 RHP Giovanny Gallegos assigned to Tampa Yankees from Staten Island Yankees. May 28, 2015 RHP Giovanny Gallegos assigned to Staten Island Yankees from Trenton Thunder. May 26, 2015 RHP Giovanny Gallegos assigned to Trenton Thunder from Scranton/Wilkes-Barre RailRiders. May 24, 2015 RHP Giovanny Gallegos assigned to Scranton/Wilkes-Barre RailRiders from Trenton Thunder. May 23, 2015 Trenton Thunder activated RHP Giovanny Gallegos from the 7-day disabled list. May 15, 2015 Trenton Thunder placed RHP Giovanny Gallegos on the 7-day disabled list retroactive to May 13, 2015. May 12, 2015 RHP Giovanny Gallegos assigned to Trenton Thunder from Tampa Yankees. December 1, 2014 Yaquis de Obregon activated RHP Giovanny Gallegos. December 1, 2014 Yaquis de Obregon placed RHP Giovanny Gallegos on the reserve list. June 6, 2014 Charleston RiverDogs activated RHP Giovanny Gallegos from the 7-day disabled list. May 28, 2014 Charleston RiverDogs placed RHP Giovanny Gallegos on the 7-day disabled list retroactive to May 27, 2014. April 16, 2014 RHP Giovanny Gallegos assigned to Charleston RiverDogs from Staten Island Yankees. April 12, 2014 RHP Giovanny Gallegos assigned to Staten Island Yankees from Charleston RiverDogs. March 31, 2014 RHP Giovanny Gallegos assigned to Charleston RiverDogs from Staten Island Yankees. November 6, 2013 Yaquis de Obregon activated RHP Giovanny Gallegos. June 17, 2013 RHP Giovanny Gallegos assigned to Staten Island Yankees from GCL Yankees1. December 23, 2012 Yaquis de Obregon activated RHP Giovanny Gallegos. December 22, 2012 Yaquis de Obregon activated RHP Giovanny Gallegos. November 26, 2012 Yaquis de Obregon placed RHP Giovanny Gallegos on the reserve list. October 27, 2012 RHP Giovanny Gallegos assigned to Yaquis de Obregon. June 18, 2012 Giovanny Gallegos assigned to GCL Yankees. January 6, 2011 New York Yankees signed free agent RHP Giovanny Gallegos to a minor league contract.